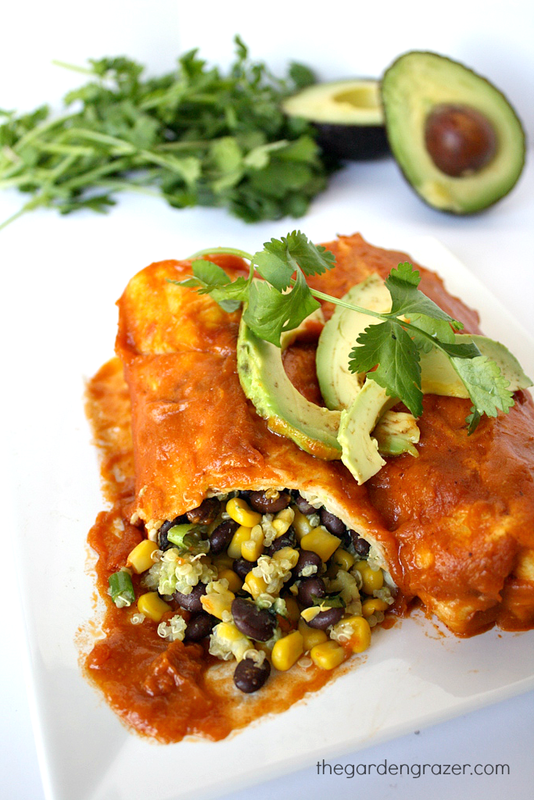 Savory Vegan Black Bean Quinoa Enchiladas with Avocado and a homemade enchilada sauce! I’m so excited that I finally veganized our all-time favorite Black Bean Spinach Enchiladas! It posed a challenge since there was so much cheese, and I wanted to find a replacement other than soy cheese shreds (even though that works great too). So of course, creamy avocado came to mind and I also added quinoa for an extra protein/nutrient boost. And not wanting to miss out on a little cheesy flavor… I sprinkle nutritional yeast on top before serving! The sauce ingredients look long, but half are simply spices you can change up to your own liking. (Try ground chipotle for a smoky kick!) It’s an easy, delicious sauce you’ll want to eat with a spoon… I may or may not speak from experience 😉 Hope you give these a try! Come join The Garden Grazer on Instagram 🍓 and share a pic if you make these! I love seeing what you guys cook up. 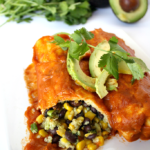 Healthy, vegan Black Bean Quinoa Enchiladas with creamy avocado and smothered in a delicious, savory homemade enchilada sauce! Rinse and cook quinoa according to package directions, using 1 cup water (or veggie broth). Meanwhile, make the enchilada sauce: in a small bowl, add flour and spices. In a saucepan over medium heat, add olive oil. Once warm, add tomato paste and flour/spices. Cook 1 minute, whisking. Whisk in broth, and bring to a boil. Reduce heat to simmer, and cook until thickened, about 8 minutes. Salt/pepper to taste. Meanwhile, dice the avocado, and slice green onions. 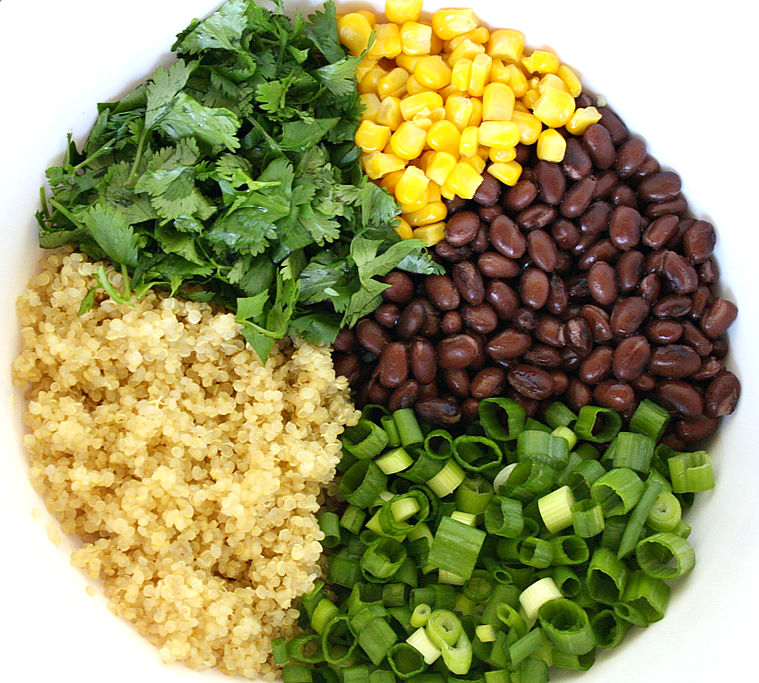 In a large bowl, add black beans (rinsed and drained), corn (thawed if frozen), green onions, cumin, and lightly sauteed spinach if using. Add cooked quinoa, and stir. Add avocado and lightly toss to combine. In a lightly sprayed 9×13 baking dish, pour a small amount of sauce to coat the bottom. Evenly distribute the black bean/quinoa mixture to the center of each tortilla, roll up, and place seam side down in the dish. Pour remaining sauce over the enchiladas. Optional: garnish with cilantro, green onions, or sprinkle nutritional yeast before serving. For gluten-free: use GF all-purpose flour and GF tortillas. Mmm these look so wonderful, and vegan too! love it! Two Thumbs up from DH! These were a hit at my house. Thank you for this great recipe! I can't wait to try these! I already love the Black Bean Spinach Enchiladas which are a staple in my house! Awesome Stephanie!! Thanks so much for the message 🙂 Hope you love these just as much! Hi Lisa! YAY – so glad you enjoyed them! I use large tortillas so my enchiladas are usually pretty big 😉 Definitely makes more if you use smaller or corn tortillas. Thanks for the message!! I posted pics of mine on Instagram, but I had to pop back over here and thank you for this recipe. These were absolutely amazing and I want to put that sauce on EVERYTHING! Thanks for the recipe. Lot's of colour; so healthy and looks delicious! ThesE were so good! It's tough filling up a vegan athletic man but this got a rave review from both of us. Hi Shery! Yay! So awesome to hear. 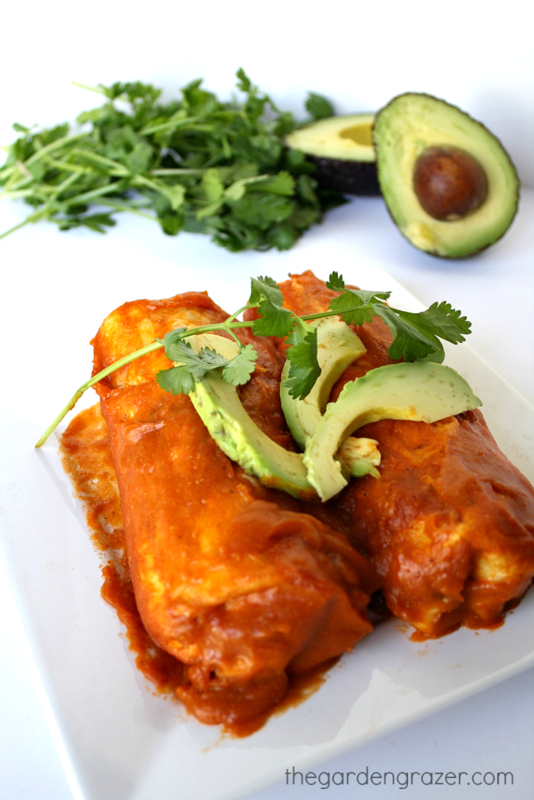 You might want to check out the "Protein Monster Vegan Enchiladas" as well if you like these! And does chasing after a toddler qualify me as a vegan athlete? 😉 Haha – wishing you both a wonderful week! Yay! So glad you enjoyed it 🙂 It's awesomely versatile too! Is the cumin in this recipe cumin seeds or cumin powder? Do you know how well these freeze? Huzz and I both thought the quinoa bean mixture would be a delicious salad with some tomatoes, sweet onions and salt and pepper. Thanks for the recipe! Hi Shawna! YUM – good call with the mixture as a salad, that'd be awesome! Definitely one of our favorites is the "quinoa avocado spinach power salad" on the site 🙂 Have a great week! I just made these for my family. They were incredible. We were both shocked at how good they were. Truly excellent recipe! Thank you sooo much. Fantastic to hear!! Thanks so much for your kind words 🙂 Wishing you and your family a great week! Made these for dinner tonight. Absolutely amazing!!!! Thanks for sharing this recipe. Hi, I'm trying to go vegan for 30 days to see if I feel better. These recipes sound great. What is the nutritional yeast? Is it a seasoning or flakes? What brand do you use? Does the avocado go IN the enchiladas or only on top? Thanks for sharinf this recipe! Excited to try it tonight! Hi Jackie! We put the avocado in the enchiladas 🙂 (And often more on top for serving after they bake!) Hope you enjoy it tonight! Love love love them! We are not quite at the complete "vegan" stage. Just getting my husband to try these was a feat in and of itself. So I did add about 2 tablespoons of cheese. Once he tried them he loved them. He exact words were "these are awesome. I could drink that sauce". I have a book of Pinterest recipes that I print out. That way when I don't know what to make we can go back through and see what we've had and liked. It has already been added. I always have everything for this on hand. Aww, yay!! Thanks so much for taking the time to leave such a sweet comment 🙂 Absolutely thrilled to hear how much you and your husband enjoyed these! Wishing you both a wonderful weekend!! Hi Danielle!! Yay, that is so awesome to hear 😀 Glad you enjoyed them enough to make again! Have a beautiful week!! I made these tonight! I'm not vegan but both my daughters are, so I am experimenting with vegan recipes so I can teach them. These were delicious! I will definitely make these again! The only change I made was to omit corn, I just don't like it/can't digest it. I added sauteed spinach. My first experience with quinoa too! Love this recipe! Hi Terri! Sorry this response is so delayed but YAY – it's great to hear from you! I LOVE that you're cooking vegan meals for your daughters, what a sweet mom! Happy you enjoyed these and that your first quinoa experience was a success 🙂 Thanks so much for coming back to let me know! Hope you all have a beautiful weekend!! Love these enchiladas!! This time I had some leftover Mexican bean and rice soup that i needed to use up that had developed a thicker consistency overnight. No corn but still added the avocado and used this same sauce! We loved them! Thank you for this beauty!! Awesome to hear!! What a great way to repurpose that leftover soup, I love it! Glad you enjoyed – have an awesome weekend! This a new favorite dinner, THANK YOU!!! YAY! So great to hear your first enchilada experience was a success! Thanks for the sweet feedback – have a lovely week!